It is such a simple dish to make, really. 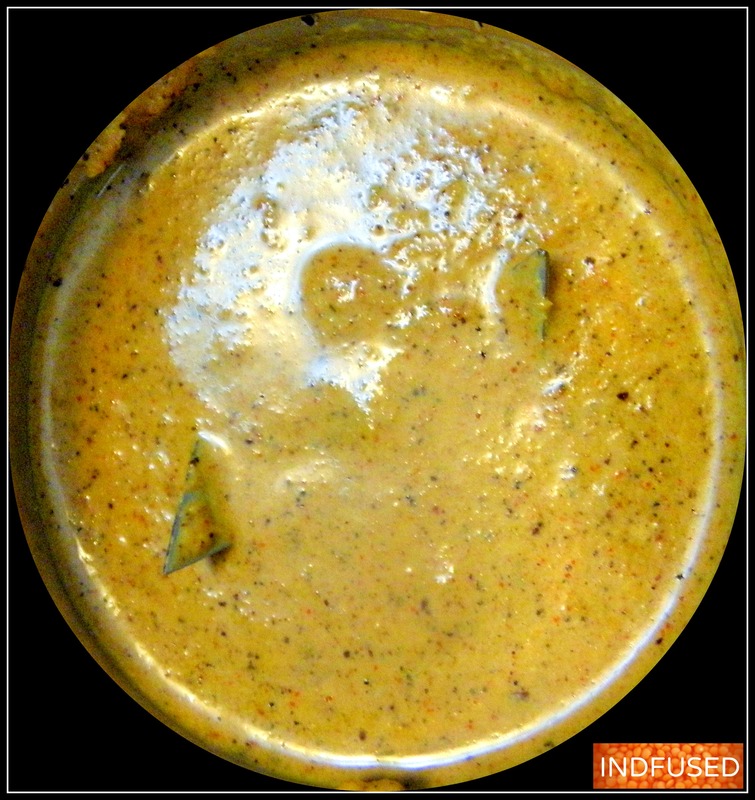 But when the ambrosial mango and pineapple combine with the coconut, chili powder and mustard seeds, it creates an explosion of flavors! 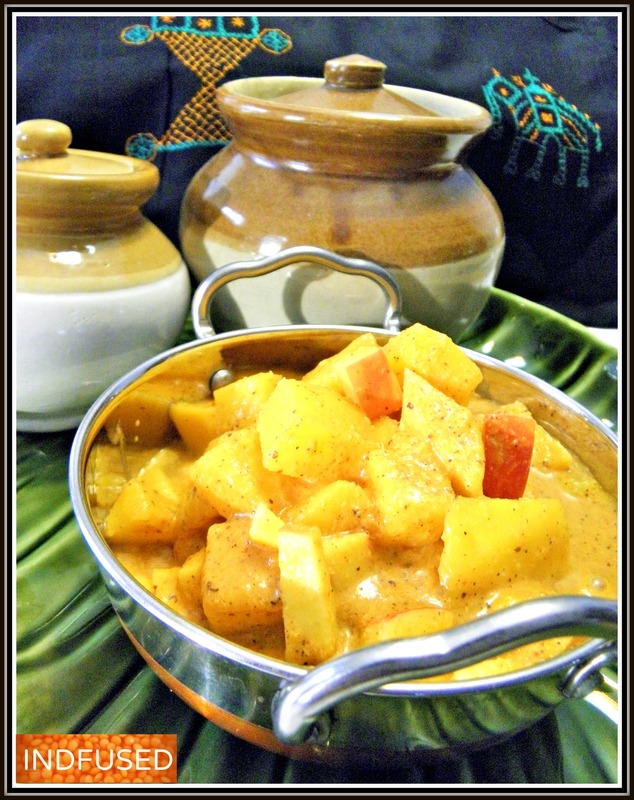 With great tasting fresh pineapple and mangoes in the market now, I thought this would be a good time to share this recipe.My twist to this ancestral recipe was to add a little diced apple because I like the little crunch it adds to the texture of the dish. The key to this dish is finding the ripe, juicy fruit. If not, you may have to add a little sugar and lime juice to balance the flavors. So a little about Sasav. I believe the word comes from ‘sasam’ which means mustard seeds in Konkani. This dish comes from the coastal region of Konkan, where mangoes, pineapples and coconuts are so plentiful. Adding the mustard seeds not only gives the dish a delectable pungent flavor, but also adds so many health benefits. Mustard seeds are said to help with cholesterol, insulin and brain health. Plus the mustard seed plant is a crucifer, the same family as kale, broccoli and brussel sprouts. I am always impressed by the genius of our ancestors in putting together certain spice and food combinations, aren’t you? There are so many of these great examples all across the globe, in so many different cuisines! Hmmm…food for thought….but lets get back to the food first:) So here are the ingredients for the Pineapple and Mango Sasav. ¼ cup grated fresh coconut. I defrosted and used the frozen grated coconut. ¾ teaspoon black mustard seeds, dry roasted. I used the dark reddish brown mustard seeds. 1 cup fresh pineapple chunks. Choose a juicy, ripe pineapple too. Grind to a fine paste the coconut, roasted mustard seeds and the red chili powder. Add to the rest of the ingredients, mix and serve! See how easy it is? But the taste will bowl you over !Plus this is a ‘no cooking required’ recipe! I am taking this to Angie’s Fiesta Friday. Come join the party and check out the amazing talent there. My mouth is watering at your description 😀 Yum!! This does look like an explosion of flavors….yum! My mouth was literally watering as I read the ingredients on this one. I have not heard of it, but anything with mango in it has to be a winner! With the warmer weather, I’m sure it will be a hit! We hit 75 deg here today, I’ve been in my garden all day long, it’s just magical! I’ve just come in to pour myself a cocktail and sit in the patio area and check out some more blogs :). I hope you’re doing well. It is so nice to hear from you. I am doing okay. The blog is a good distraction a sit keeps us so busy. Thank you so much for asking. We are still freezing here because it has been so windy but most of the snow melted last weekend. I hear we are getting some snow flurries again tomorrow! So it feels good to hear about your 75 degree weather and you pouring yourself a cocktail! Sounds heavenly. This sasav is always a hit at the party. There is something magical when the mango and pineapple tastes come together. Thank you. Yes it tastes delicious! The tradition of Indian cuisine is ingenious indeed! So true Gregg! And what a huge variety of recipes we have, right? Yes, the cuisine is as diverse as the country itself. Never tasted this preparation.. looks interesting- a combo of two fruits made with coconut . My husband loves this. I am sure it will be up for trials this weekend when he cooks. Thanks Seema! Do post photos. Definitely an interesting dish, never cooked pineapple and mango together like this. My mouth is literally watering here. Lovely share. I know the ghonta sasav too…wish I could get some ghonta here Freda! I tried sasav couple of days back for the very 1st time. It’s a winner recipe at my home. It is such an incredible dish with blend of so many flavours yet very easy and quick to prepare. Thanks so much for sharing this fabulous dish Sandhya. I am so happy to hear that your family loved it too! Thanks so much for letting me know. Such a lip-smacking dish Sandhya! I always love some tangy, sweet and spicy dish with every meal. Love it! Thanks for sharing! Slurp slurp, my mouth is watering here. Too tempting with sweetness & tanginess to the core. Lipsmacking here. Absolutely love Sasav with some steamed rice and toop. Killer combo and that perfect comfort food that reminds you of your roots. Loved the recipe, we south indians make something similar called pachadi with mustard and coconut too. Interesting recipe. Never mixed pineapple, mango and coconut together. I loved the way you described the recipe. It’s actually very tempting. Its for the first time I’ve heard of sasav, a good intro to the awesome recipe. While I was reading the post my water was literally watering. Waiting for the mango season to start again here so I can make this awesome dish. Thanks Mayuri! Do try it next season. When you said that i is like a raita, I kept on searching for the curd..lol. But seriously, It is an interesting recipe. Definitely going to give it a try for sure. Sasav is a new dish to me. To me it sounds a delicious blend of tropical flavors . Thanks for introducing this easy yet delectable heirloom recipe to us Sandhya. This is so delicious and love the fact it is a no cook recipe. I need to try this sometime, thanks for sharing Sandhya. with the name itself my mouth started watering. looking such a lip smacking side dish. Bookmarked. I know pineapple taste great with spices. Will try this with pineapple. Thanks Jagruti. I never seem to get enough of the sasav too.